The rise of a team like the undefeated Immortals might explain why some League of Legends fans feel that the pro game is getting boring. On Saturday night, Immortals crushed a gutsy, tied-for-second Counter Logic Gaming team with ruthless discipline and skill… and showed why discipline is so hard to love. Immortals have been one of the big surprises of this 2016 season. With monied investors backing the team, the brand-new esports organization acquired the celebrated Korean duo of top laner Heo “Huni” Seung Hoon and his jungler-wingman Kim “Reignover” Yeu Jin… and then married them to a lineup of North American players who had been cut from other teams. The squad seemed destined for a middling freshman outing, but so far this season they’ve left far more prestigious rosters in the dust. Judging from Saturday’s game, Immortals are not quite a freakish, Golden State-like superpower. There were even a few moments where CLG seemed to get the better of the frontrunners, thanks in part to some inspired team-fighting. 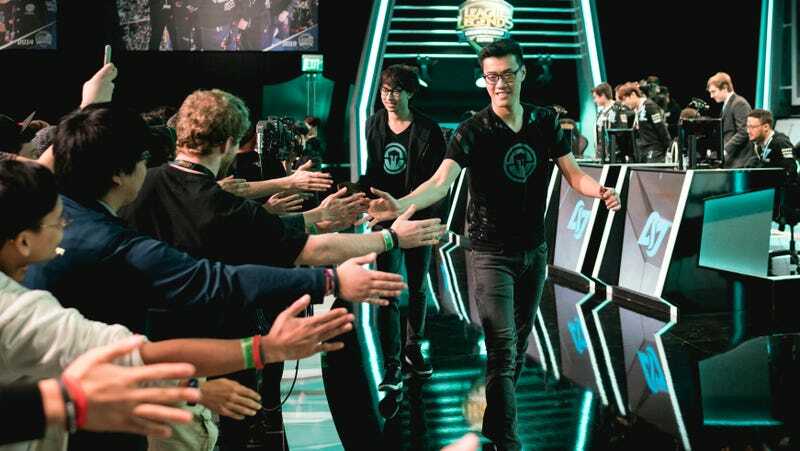 What gave Immortals their victory over CLG in Saturday’s game was discipline and planning. Immortals responded to flashes of brilliance and daring from CLG with cool calculation and patience, and that carried the day. Avoiding mistakes is often better than big plays in League of Legends. CLG demonstrated this in painful fashion about 12 minutes into the match, when they won a close fight and got a 3-1 exchange against Immortals. It would have left the game roughly even, erasing Immortals’ early gains. But CLG pushed their luck, re-engaging after an abortive retreat and suffering three kills in quick succession. At a stroke, they’d annihilated their best play of the night. Contrast that moment with the exchange that gave Immortals the victory. They fenced with CLG around the Baron pit for several minutes, happy to spam ranged attacks until sunrise if they didn’t get the look they wanted from CLG. It was only once Immortals finally landed a hard hit on CLG’s Aphromoo that they descended on CLG like the 82nd Airborne on Normandy, and the match snowballed from there. Immortals have a knack for making this kind of victory look easier than it is, committing to attacks only when success is almost assured. They don’t force things the way CLG did, which is why Immortals remain undefeated and CLG have dropped to third place. Immortals are a great team because they play like they don’t need to prove it.